are you serious about this or is this a joke? Both, I was making fun of the we must ban (pick the item) crowds. If bans are worth it because it might save a single life then we should step it up a few thousand notches and control people until they are old enough to stop doing dumb things. 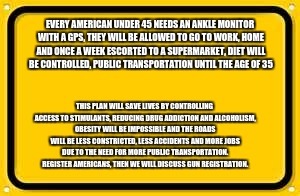 EVERY AMERICAN UNDER 45 NEEDS AN ANKLE MONITOR WITH A GPS, THEY WILL BE ALLOWED TO GO TO WORK, HOME AND ONCE A WEEK ESCORTED TO A SUPERMARKET, DIET WILL BE CONTROLLED, PUBLIC TRANSPORTATION UNTIL THE AGE OF 35; THIS PLAN WILL SAVE LIVES BY CONTROLLING ACCESS TO STIMULANTS, REDUCING DRUG ADDICTION AND ALCOHOLISM, OBESITY WILL BE IMPOSSIBLE AND THE ROADS WILL BE LESS CONSTRICTED, LESS ACCIDENTS AND MORE JOBS DUE TO THE NEED FOR MORE PUBLIC TRANSPORTATION. 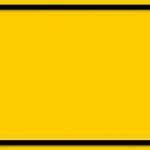 REGISTER AMERICANS, THEN WE WILL DISCUSS GUN REGISTRATION.